New! The fourth addition to the Collector´s Series is a modified version of the European truck topper Bibendum figure. Original truck topper figures are known to be some of the most highly sought after Michelin Man items among collectors and Michelin enthusiasts alike. The truck topper Bib figure, usually made of plastic, was commonly found mounted atop Michelin delivery trucks or company vehicles that traveled the roads of Europe during the 1960s through the early 90s. Often, these Bib figures were illuminated. The new “Bib Sitting on Tire Stack” design is based on this famous truck topper figure. It features a unique design that incorporates a stack of miniature Michelin tires as its base. 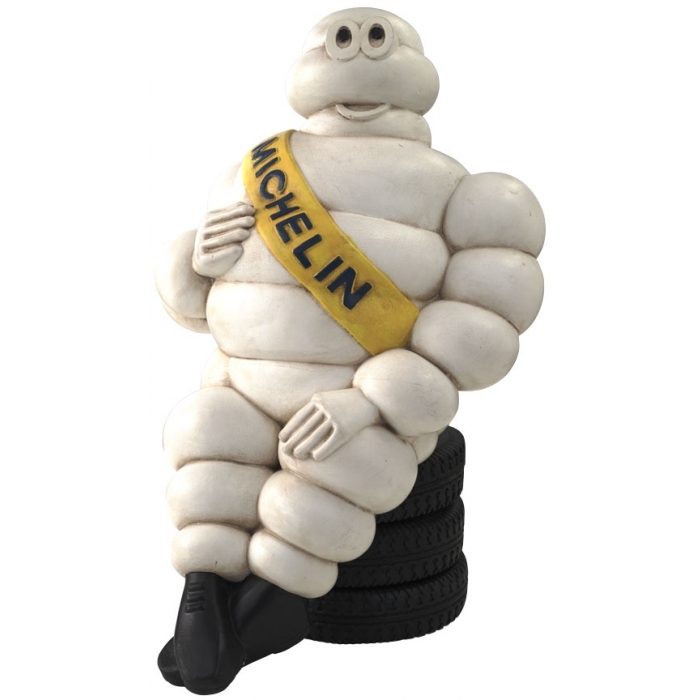 The figure sits atop these three real tires that feature the famous Michelin Double Rivet vintage tread design. Each tire features authentic sidewall markings.